Sporting 3 regulation indoor Racquetball Courts, you can engage your favorite opponent in a lively and exhilarating game of racquetball any time during regular club hours. Give us a call to check on availability and schedule your court time. Racquetball courts are for racquetball play only. Members may reserve a racquetball court for up to 1 ½ hours, and members may make a racquetball court reservation up to 2 weeks in advance. Interested in connecting with other racquetball members? 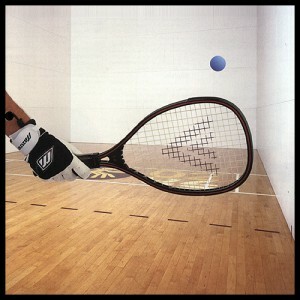 Contact our racquetball guru: Jim Baldanza at jimdanza@gmail.com or 314.422.8804. Looking to change up your game? Walleyball is the way! will improve your coordination, balance, strength, power and agility. Contact Kimberly Daws for more details.